Has your child ever decorated their own room at Christmas? It’s a lovely way to make the home feel even more festive and you can get some adorable small Christmas trees that would fit perfectly in a child’s room. Last year, we had a “Nightmare Before Christmas” theme in our home, complete with spooky decorations and cobwebs instead of snow! 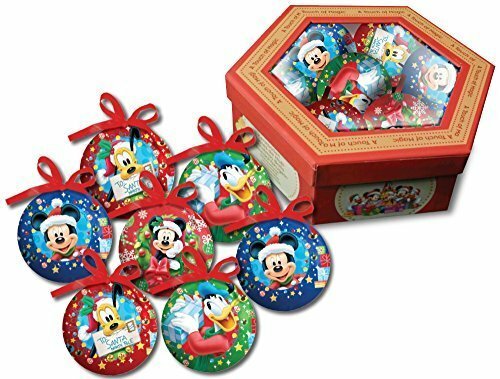 If your child is a Disney fan, there are some lovely Disney Christmas decorations available! The Nightmare Before Christmas is a favourite film in our home – we love the combination of Halloween and Christmas combined! 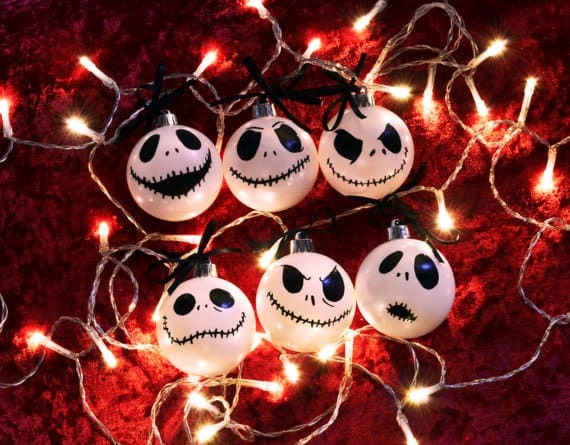 This set of Nightmare Before Christmas inspired decorations are hand painted and can be shipped worldwide. 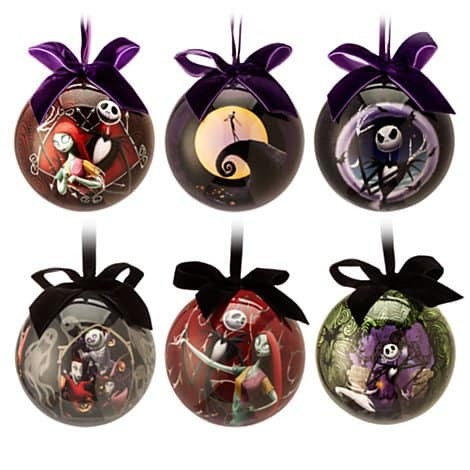 If you like the look of these, there are also plenty of other sellers doing variations of hand painted decorations with a Nightmare Before Christmas theme. 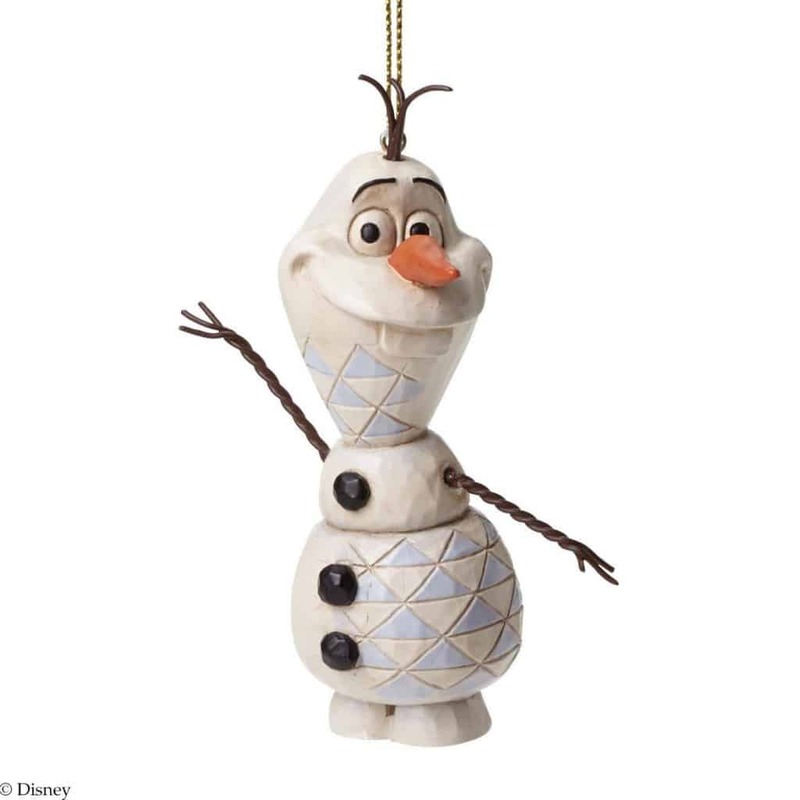 What about this adorable Olaf inspired Christmas decoration? He looks like he’s been crafted in wood, but in fact he’s hand painted resin. He comes in his own gift box. There are many other styles available via this seller, from Beauty and the Beast to Snow White, there is a vast range available. The attention to detail and quality of these pieces is really impressive and they’d also make a lovely stocking filler. 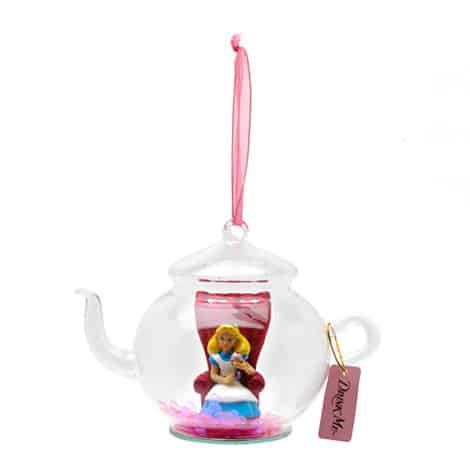 I think this Alice in Wonderland bauble is simply magic. The Disney store has a wide selection of glass baubles and decorations, with various themes from different Disney movies. But this one is my particular favourite. People do seem to have gone minions crazy – but the films are brilliant, so why not! 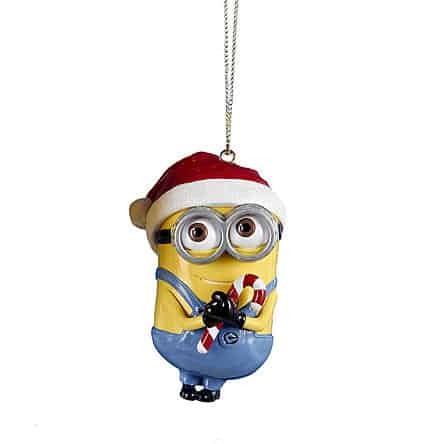 This little minion Christmas decoration, with Dave lovingly clutching a candy cane, would be a sweet addition to your tree and a thoughtful gift or stocking filler for a minions fan. He’s great value too, check him out. A great full set of eight figures, all inspired by the Toy Story Disney film. A lovely gift for a Toy Story fan. Disney Planes, Disney Princesses and Frozen variations are also available. £11.99 for the set on Ebay. Another Frozen decoration, but this one has a special feature – she’s musical! Press the button on the back and “let it go” is played. Elsa stands on an ice balcony, wearing a blue dress with glittery detailing. This would make an extra special edition, either to a Disney or Frozen themed tree – or just as a stand alone unique Christmas ornament. £14.95 from The Disneystore. I hope you find some Disney Christmas Decorations perfect for you this Christmas. If you’re feeling in a creative mood – check out this video for some great ideas of how you can create your own fabulous DIY Disney Christmas decorations! A great activity that you could do over the Christmas holidays with the kids. 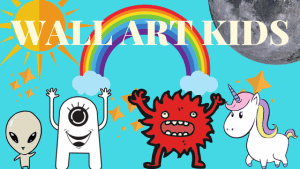 Christmas wall stickers are also a great way your kids can decorate their rooms this Christmas – check out some great ones here. You’re very welcome to leave me a comment! Merry Christmas! What a lovely post just in time for the festive season! What a nice idea to get children to decorate their own rooms and I love the idea of having a different theme each year! 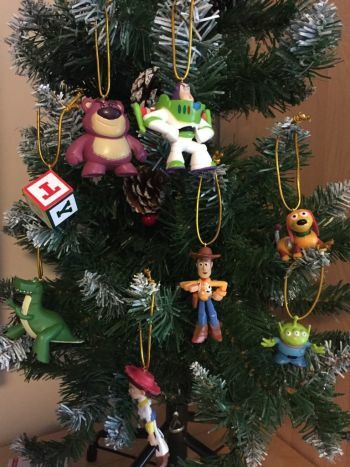 I know one little boy in particular who would love the toy story decorations I may have to buy some of those! The minion and Olaf decoration are so cute! Seriously, I don’t mind hanging 10 of them (or more) on my Christmas tree. But I am sure my niece would like a spot for Frozen Elsa singing. Just out of curiosity, are there any ornaments that play Jingle Bells instead? I agree, love olaf but I’m sure the singing elsa would be very popular for a frozen fan. In my research I, (surprisingly) didn’t find any ornaments that played jingle bells, (although I’m sure there must be some out there!). I did however find a singing reindeer…. and there is a singing santa and snowman too 🙂 Thanks for your comment! These Christmas ornaments look so nice, specially the one from Alice in Wonderland. I was looking for something similar but with music. Does the Alice in Wonderland play a melody or tune? Also the Frozen Elsa looks so neat. I would like something with music or a Christmas melody. Hi there, the alice one is gorgeous – unfortunately it doesn’t play music and the Elsa decoration is the only disney one I’ve seen, as yet, that does. I hope you manage to find one! Let me know if you do 🙂 All the best! I have only one niece and no daughters so it is always overwhelming going shopping for girls (weither for my niece or friends) but I like that you have some very cute stuff here to give me ideas without seeing so much and not knowing where to start. Wow on a side note, I love all your dinosaur wall art. I have 4 boys and all 4 of them are such big dinosaur fans. I have never decorated their room dinosaur because I am always worried they will be too scared to sleep. But I feel that am over due to do something with their rooms and hate to do something that they will lose interest in. Hey there – thanks well, that’s the good thing with wall stickers. You can stick them up and peel them off whenever, so if they’re suddenly not dino fans, you can switch to something else. 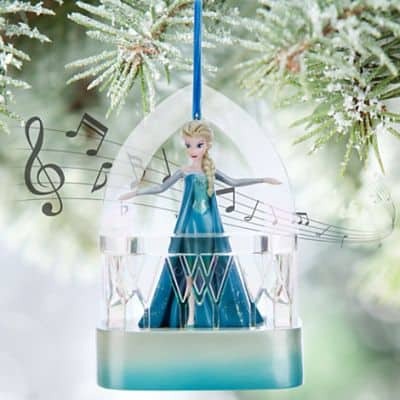 My oh my… that singing Elsa globe would be a HUGE hit at my house! My daughter hasn’t yet seen the movie (will be a Christmas present this year), but she already LOVES Elsa and Anna… and she would be thrilled to have an Elsa figurine on her/our Christmas tree. What a fun post! I had never thought of doing a Disney Themed Tree… hmmm… might have to pass that idea by my husband LOL.